Braided Jute Rugs in Blue & Burgundy by Earth Rugs | P.C. Fallon Co. 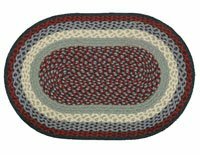 The classic color combination of blue, burgundy and ivory jute fibers are woven into beautifully textured oval braided rugs to complement your home. Many sizes to choose from. If you're in doubt about the color, please note that an inexpensive 10" swatch is available for purchase which would allow you to view a rug swatch in your home. Blue & Burgundy Oval Braided Rug 20"x30"
Blue & Burgundy Oval Braided Rug 27"x45"
Blue & Burgundy Round Swatch 10"x10"
Please note that as with all hand-crafted, artisan-made products, slight variations in color, size, and shape of these natural jute rugs will occur and are to be expected.